· How to understand the importance of the interest rate in commercial real estate. Download your free audio book at Audible. · Ask The Investors: How do I choose the best stock broker? Access a world of knowledge with The Great Courses Plus. Home security done right with SimpliSafe. Get quality shaving at a fair price with Harry's. · Why Nucor, Steel Dynamics, and the entire industry is trading at appealing prices. On today's show, we talk to Dr. James Rickards about central banks and their impact on financial markets. · How the Fed Chairman is signaling to the market what he plans to do. Stop wondering and start saving with ME Bank. On today's show, we learn valuable investing lessons from legend Stanley Druckenmiller. On today's show, we talk to World Poker Champion, Annie Duke, about how she thinks in bets. Make your business travels easy with Clear. Build wealth through real estate with Roofstock. On today's show, we learn valuable lessons from Silicon Valley billionaire Larry Ellison. · How the very early years of a persons life might greatly impact their personality and approach to solving problems. On today's show, we learn valuable lessons from Silicon Valley billionaire Reid Hoffman. · What is the secret to the success of Silicon Valley? · How to manage a company that is growing at 2.5% - per day! · Ask The Investor’s Podcast: How do I value fast growing unlisted companies? On today's show, we talk to the best-selling author, Jonathan Tepper about investing during Bear Markets. On today’s show we bring back our good friend, Jesse Felder. Jesse is a former multi-billion dollar hedge fund manager out of Santa Monica California. Jesse is regularly featured on the Wall Street Journal, Barron’s, and many other national level business outlets. Create original investment research with INVRS. Move your business forward with TripActions. Explore a mobile plan that can change as your business does with Telstra. Ask The Investors: What do you think about Ray Dalio’s All Weather Portfolio? Get access to the future of real estate investing with Fundrise. · What Peter Thiel knows that no one agrees with him on. · Ask The Investors: How much should value investors pay attention to the bond yield curve? Ask the Investors: How do you find a co-founder, and how did Preston and Stig meet? Send money overseas without being short-changed with WorldFirst. · Ask The Investors: Do you use components of dollar cost averaging as intrinsic value investors? Solve your long list of must-reads with Blinkist. · Why we’re not in a typical credit cycle. Keep learning and thriving with Skillshare. · Ask The Investors: Should I add bonds to my portfolio? Preston’s intrinsic value assessment on Apple Inc.
· Ask The Investors: Do you use a checklist when picking stocks? · How Richard Branson does not let knowhow and capital constraints stop his business ventures. · Ask The Investors: Would you both have passive and active investing in your portfolio? · How should gold be allocated in your portfolio when you plan for retirement. On today's show, we talk to billionaire, Howard Marks. Mr. Marks has produced a 19% annual return for the past 22 years investing in distressed debt. He has been a money manager for 50 years and is a renown luminary in security analysis. On today's show, we talk to Dr. Wesley Gray about artificial intelligence and the impact on the finance industry. On today's show, we get the rare opportunity to interview one of our heroes, Tony Robbins. Tony is an American Entrepreneur and NY Times Best Selling Author of multiple books. During our discussion, we talk about Tony’s book Unshakeable and Money Master The Game. Additionally, we talk to Tony about the things that matter most, which is how a person can find their higher purpose, how to accomplish the things people want to master, and most importantly, how to have a real impact. Know when to buy and sell based on statistics and momentum w/ TradeStops. Take a better position on trading with CMC Markets. · Why investors in 401(k) plans put up 100% of the capital, take on 100% of the risk, and only 33% of the return. · Why you should plant your seeds when you have nothing, to gain abundance in business and life. On today’s show, we are going to be covering billionaire Bill Gates. As many people know, Mr. Gates is the co-founder of Microsoft and he now runs the largest non-profit in the entire world. · Ask The Investors: Is it a problem that we have fewer and fewer listed stocks? On today’s show we are going to be covering billionaire Mark Cuban. After being fired from his first job, Mark started his own company called Micro Solutions. Within a decade, Mark sold the company for 6 million dollars and started a second business that streamed college sports over the internet. Within another decade, Mark sold Broadcast.com for 5.7 billion to Yahoo! During our show, we play some interesting questions that Mark has been asked about his time as an entrepreneur. · Why Mark Cuban invested every penny, he had into a put option after he sold his company to Yahoo! · Why Mark Cuban wants you to consider if you’re adding or reducing stress? · Ask The Investors: Is the stock market a zero-sum game? On today's show we have Richard Duncan. Richard has worked for the IMF and World Bank and is an expert on monetary policy. During the show we talk about the impact of tariffs and the escalating trade war with China. · Why the US government might choose to talk about tariff rather than impose tariffs. On today’s show, we have assembled our mastermind group for the 3rd quarter of 2018. At the start of 2018, the US Stock market experienced a 10% correction. But since that time, equities have had a strong comeback and are now considered the longest running bull market in the history of the NY Stock Exchange. The members participating on today’s show are Tobias Carlisle, Hari Ramachandra, Stig, and Preston. On today’s show we bring back our good friend, Jesse Felder. Jesse is a former multi-billion dollar hedge fund manager out of Santa Monica California. Jesse is regularly featured on the Wall Street Journal, Barron’s, and many other national level business outlets. We start off the discussion talking about gold and what lies ahead. As the show progresses we talk about the tariffs and the impact on the US Dollar. We talk Fang, we talk Elon Musk, and much more. On today's episode we talking to Dr. Richard Smith. Smith is an expert at momentum investing and is the founder of the popular investing website, TradeStops. During the discussion Dr. Smith talks about the current market conditions and which industries might perform the best for the rest of 2018. On today’s show we are talking about the famous Chinese billionaire, Jack Ma. Jack’s personal net worth is is around 42 billion dollars. He’s the founder and executive chairman of the Alibaba Group. In 2017, he was ranked 2nd for the World’s greatest leaders by Fortune Magazine. During the discussion we play some interesting Q&A's Jack has been a part of during the past two years. · Ask The Investors: How do you evaluate the performance of managements when investing in a stock? On today's show, we learn about investing in the renewable energy market. Today's guest is Bryan Birsic and he's the founder of Wunder Capital. His company invests over $100M in the renewable energy market and has a deep understanding of how the market might progress in the future. · How do renewables do as an investment during a recession? · What are the bull and the bear case for investors in renewables? · Why are electricity prices so volatile, and why are they sometimes negative? · What would happen if we took away all subsidies in renewables? On today's show, we learn about the biggest mistakes that legendary investors have made throughout their career. Our guest, Michael Batnick, recently wrote a book on this topic and provides insights from what he learned. Michael is often featured on CNBC and Bloomberg and he is the Director of Research at Ritholtz Wealth Management. · Ask The Investors: Do you think the increasing number of value investors is making value investing less attractive today? On today’s show we talk to the founder of ETFmg, Sam Masucci. Sam's company is responsible for bringing the first Artificial Intelligence ETF onto the market. The name of the ticker is AIEQ, and since inception in OCT 2017, the fund has outperformed the S&P 500 by nearly twice the yield (as of July 2018). During our discussion with Sam, we ask him about the deep learning methodology and how the programmers integrated IBM Watson technology into the logic. Additionally, we talk to Sam about another artificial intelligence ETF called BIKR, which was designed and launched by the legendary investor, Jim Rogers. Ask The Investors: How can we use Price-to-Sales in our valuation process? On today's show we play some of the best questions and answers we could find from interviews with Jeff Bezos. Jeff is the founder of Amazon and the wealthiest person in the world (over 140 billion). On today’s show we talk about the very popular entrepreneur, Daymond John. John rose to business stardom after creating the global clothing line FUBU. Later he became a celebrity figure on ABC’s Shark Tank. After looking through various book recommendations from our audience, we kept getting a similar recommendation: The Power of Broke by John. The book provides some great insights into Daymond’s life before FUBU and how he created the business, but the part of the book we liked the best was his guidance and recommendations for people that are starting their own business. On today’s show we talk about a subject that so many want to master, but few understand where to start. The topic of today’s show is Creativity. Now, you might be asking yourself, how can I develop the right idea at the right time, and today’s guest is one of the leading experts in that field. This might be hard to believe, but Allen Gannett is only 27 years old. And as soon as you hear this interview, you won’t believe the amount of knowledge and insights he brings to the topic. In fact, Allen is so bright that at age 24, he was selected onto the Forbes 30 under 30 list. Additionally, he has created a highly successful business that's in the field of big data analytics. For the research of his book, Allen interviewed a billionaire, one of the wealthiest members of Congress, and even CNBC host, Andrew Ross Sorkin. Click here to purchase Allen's book: The Creative Curve. · How you can keep reinventing success in different fields. In this episode, Preston and Stig talk about their experience of attending the 2018 Berkshire Hathaway Shareholder's meeting. The Investors play five of the best Q&A that occurred during the meeting. After each question, Preston and Stig provide their feedback and analysis on Buffett and Munger's responses. · If Elon Musk is right about Warren Buffett’s being wrong about competitive advantage? If Buffett plans to sell his investment in Well’s Fargo after the recent scandal? How Buffett evaluates the attractiveness of bonds. One of the most lucrative and highest yielding areas of investing is finding quality companies in the small-cap market. The difficulty with investing in this space is the companies often lack stability and market dominance to make some investors comfortable. On this episode, we talk to a leading expert and former hedge fund manager that has invested in the small business space over three decades. Eric Cinnamond currently runs his own blog where he provides a detailed analysis of all the conference calls and small-cap companies he follows (a couple hundred businesses). On today’s show, we interview the NY Times bestselling author Jonathan Tepper. Jonathan is the owner of the macroeconomic research group that provides leading indicators to various asset managers. He is a Rhodes Scholar and a graduate of Oxford University. We talk to Jonathan about Buffett’s approach to investing in concentrated industries along with his thoughts on inflation. Jim Rickards is a New York Times Best Selling Author and major authority in central banking policy. Jim has worked on Wall Street for more than 35 years and his comments and commentary are frequently aired on CNBC, Bloomberg, and countless other national level news organizations. His books are on the recommended reading lists at businesses like Bridgewater Associates and major US banks. Our interview with Jim is two episodes long and this is the second half of the discussion. Jim Rickards is a New York Times Best Selling Author and major authority in central banking policy. Jim has worked on Wall Street for more than 35 years and his comments and commentary are frequently aired on CNBC, Bloomberg, and countless other national level news organizations. His books are on the recommended reading lists at businesses like Bridgewater Associates and major US banks. Our interview with Jim is two episodes long and this is the first half of the discussion. First we talk to him about his thoughts on the new tax bill. We talk about what has happened, and what he expects to happen moving forward. Jim talks about portfolio allocation, and we even get him to talk about crypto-currencies as well. Regardless, be prepared to her some interesting thoughts, all backed-up with a lot of statistics and analysis. On today's show, we talk to Ian Siegel. Ian is the founder and current CEO of the billion-dollar tech company, Zip Recruiter. Ian built the company from nothing in 2010 and has now served over 120 million customers. On today’s interview, we talk to Ian how he did this. We ask him what advice he can give to other people that are also trying to grow their own business from the ground up and how they will know if they have a winner on their hands. Before founding his current company, Ian was also an executive at Stamps.com and eBay during the key developmental growth of those businesses. So with all this experience and knowledge of taking start-ups all the way to the top, I think you’ll really enjoy this interview with Ian. Well, without further delay, we bring you a wealth of experience from Ian Siegel. · Why market validation is more important than raising money and building a team. On today’s show, we have assembled our mastermind group for the 2nd quarter of 2018. Some of the major market themes we have seen since the start of the year is a substantial sell off in short and mid-term duration government bonds, with the 10 year treasury briefly hitting over 3%. Since global equity markets hit a high on 25 January 2018, they have struggled to sustain that level, at the end of April 2018, the market is still down -6% since those highs. Many are attributing the slow-down in equity growth to the inflationary impacts that are starting to be seen throughout the economy. Although these are the narratives, it’ll be interesting to see what the members of the group have to say and more importantly how they structure their picks around this environment. The members participating in today’s show is Jesse Felder (a former headgefund manager of over a billion dollar fund), Tobias Carlisle (from Carbon Beach Asset Management and the best selling author of Deep Value and the Acquires Multiple), and Stig and myself. On Today's show we talk to the New York Times Best Selling author, Daniel Coyle. Daniel is a leading expert in the development of peak performing cultures. In his new book, The Culture Code, Daniel interviews people like billionaire Tony Hsieh, Pixar's Ed Catmull, and many more. If you ever wanted to know what it takes to build a top performing team, you'll definitely want to hear what Daniel has to say. · Why the San Antonio Spurs and winning significantly more games than they are supposed to on a consistent basis. In 2017, we saw Bitcoin grow by over 1300%. Ever since the start of the new year, however, things have been pretty ugly, with a year to date performance of -50%. So what in the world is happening? Is bitcoin still the darling new asset class that so many people believe in, or is something more frightening on the horizon? Well, on today's show, we are going to have a little discussion that covers both sides of the argument. In one corner we have Tuur Demeester. Tuur has been an investor in Bitcoin since the early days when one coin was only $5. Since his initial position, Bitcoin has grown by 132,000%. Tuur has a huge following with over 159,000 twitter followers because of his in-depth ideas and comments about crypto currencies. On the other side of the argument we have the talented Erik Townsend. Erik is the host of a very popular investing podcast called Macro Voices. Erik got his start as a computer programmer and by the age of 17, he was already an independent software development and design consultant. Erik is an entrepreneur that has built successful tech companies and he's also the founder of his own global macro hedge fund. Visit the full show notes by clicking here. To view the full show notes, click here. In today's episode we talking to Dr. Richard Smith. Smith is an expert at momentum investing and is the founder of the popular investing website, TradeStops. During the discussion Smith explains how a firm understanding of volatility and statistics can enable momentum investors an edge in determining entry and exit points into stocks that are selected based on fundamental advantages. On today's show, we talk to the astute Luke Gromen about the current dollar decline. Luke provides numerous details why the dollar is currently devaluing despite the FED tightening the money supply. Additionally, Luke talks about the interesting relationship with China and how they are acquiring large amounts of gold and oil to reduce their dependence on the US dollar. In general, this interview provides incredible insights into understanding currency & commodity movements and where the world is moving in the coming decade. The Compound Effect is a book written by New York Times Best Selling author, Darren Hardy. Hardy is the former editor at Success Magazine and is an expert in understanding peak business performance. To access our full show notes, click here. Malcolm Gladwell is a New York Times Best Selling author for multiple books. On today's show, Preston and Stig cover his book, Blink. Gladwell's book goes into detail exploring the things that happen in the first two seconds a person is exposed to something new. He examines why some people are able to make really good snap judgments while others are terrible. The Investor's Podcast chose this book because stock investors are constantly making good and bad decisions that are sometimes based on instinct. Hopefully, the information discussed in this episode will provide deeper clues into the reliability of using instinctive gut feelings when making investment decisions. Ask The Investors: Should you invest in ENTs or ETFs, and how do you invest in commodities? Mr. Miller was the former Chairman and Chief Investment Officer for Legg Mason Capital Management where he managed over 75 billion dollars. Today, Miller owns and operates Miller Value Partners. Through the years, Mr. Miller has been called “The Greatest Money Manager of the Decade” by Morningstar, a member of the “Power 30” by SmartMoney, and a member of the “All-Century Investment Team” by Barron’s. During the discussion, Mr. Miller talks about the current market conditions, bond rates, commodities, and cryptocurrencies. Click here to view the full show notes. On today's show we talk to private equity investing expert, Doug McCormick. Doug has been a private equity investor for two decades and his company has assets under management in excess of a billion dollars. Click here to view to full show notes. · How does the private equity model work? · What happens when a private equity company makes an acquisition? · Why has private equity industry outperformed the stock market and will it continue? · Which critical factors determine if a takeover is successful or not? On today's episode we learn about Billionaire Sam Walton. To prepare for the show we read Walton's book: Made In America. To view the complete show notes click here. · Ask the Investors: Are Warren and Charlie the competitive advantage of Berkshire Hathaway? Before the recent 10% correction, we saw more call options compared to put options by 2 standard deviations. We also saw the price at 3 standard deviations above the 200 Day Moving Average (DMA). On top of that, the Stock market is currently priced at levels only seen in 1929 and 2000. With that said, we have assembled the Mastermind Group to talk about any opportunities that still might exist in the market that could out-perform the S&P 500 index. For Toby, Hari, and Stig, they talked about individual companies. Preston, on the other hand, talked about the first deep learning, artificial intelligence ETF that’s completely autonomous in its stock selections. On today's show we bring back a popular guest, Dr. Wesley Gray. He has an interesting approach that's a mix between value and momentum investing. Dr. Gray discovered this approach after conducting years of research and backtesting of both styles of investing. The strategy allows him to buy undervalued stocks and also hedge the markets simultaneously. On today's show we talk to renown investment blogger, Shane Parrish. Shane is a Buffett style investor that reads and studies everything about the markets. On today's show we talk to Shane about learning and optimizing. He also discusses his opinions on the difference between Ray Dalio and Warren Buffett's investing approach. Attend the Berkshire Hathaway Shareholders' Meeting with Preston and Stig. As the stock market continues to make new highs day after day, we look at recent comments by Billionaires Ray Dalio and Bill Gross to try and understand what's happening and what might happen moving forward. To see the sources of various audio clips played on the show, please visit the show notes. On today’s show, we bring back a guest that often yields some of the biggest praise from our listeners. His name is Richard Duncan and this is the third time we’ve had him on the show. Richard comes with a wealth of knowledge and over 30 years of experience working for organizations like the World Bank, the IMF, large cap asset management companies, and many more. He’s the author of three incredible books that discuss macro economics and how the world of finance functions in a fiat world. During today’s discussion we’re going to talk about the bond market and how it’s yield is potentially creating an environment for the stock market to go even higher. Richard outlines some interesting points about how central banks are going to act in 2018 and what that means for overall market movements. So with that, let’s roll. · Ask The Investors: How do I avoid confirmation bias? Tweet your comments about this episode directly to Preston and Stig. 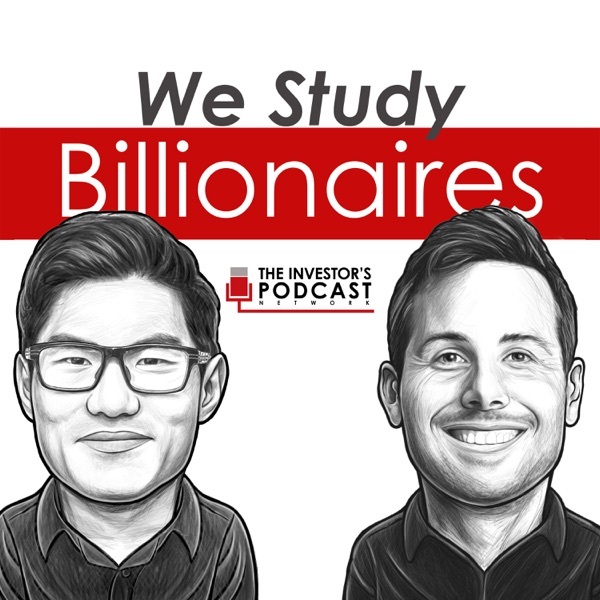 Get The Investor’s Podcast blog posts, and podcast episode updates on your Facebook feed by liking We Study Billionaires. In this episode, we review Rolf Dobelli's new book that was highly recommended by Guy Spier. The book promises to deliver 52 surprising shortcuts to happiness, wealth and success. Click here to get full access to our show notes. · Ask The Investors: Why happens to the price of Bitcoin if the stock market crashes? Today’s guest is Dan Heath and he’s a three-time New York Times best selling author. Dan is graduate of Harvard and is also a Senior Fellow at Duke University. During the show we talk about Dan's newest book, The Power of Moments. · Ask The Investors: What is the intrinsic value of Bitcoin? On today's show we talk to Ted Seides. Ted is a graduate of Yale and Harvard university and he comes with multiple decades of experience in finance. For people not familiar with Ted, most might recognize him has the gentlemen that took the opposite side of Warren Buffett’s bet with the hedge fund industry. We talk to Ted about this friendly wager, how it came about, what the results were, and what he thinks about the chances of beating the S&P 500 moving forward. Something else that’s interesting about Ted is that he has extensive experience working for the famous investor, David Swensen. Swensen has been the chief investment officer for Yale’s endowment for decades and his average return for the past 20 years is 25% annually. At the end of the interview we talk to Ted about Swensen’s greatest strengths. We also ask Ted to compare David Swenson and Warren Buffett (who Ted has become friends with through the years). · Ask the investors: What is the best approach to teach your kids finance? In today's episode we talk to former multi-billion dollar hedge fund manager, Jesse Felder. Jesse talks to us about his concern with FANG Stocks at the end of 2017. Additionally, Jesse talks to us about the potential change in central banking policy that might open the door for inflation to start taking hold in the economy. Finally, the discussion is concluded with Bitcoin and crypto currencies. · Ask the Investors: How do Bitcoin futures influence the price? When we first started our podcast, Guy Spier was one of the first guests on the show. He is the founder of the Aqua Marine Hedge Fund and he's a Warren Buffett Style investor. Guy is the author of the best selling book, The Education of a Value Investor, and he's a graduate of Harvard and Oxford University. During our discussion, we cover a wide array of topics like, what kind of daily readings he looks at, the impact of statics and humility, credit cycles, cryptocurrencies, and much more. One of the biggest names in business literature is Jim Collins. And we recently saw that Billionaire Jeff Bezos recommended Jim’s book, Built to Last. Since we are big fans of both Jim Collins and Jeff Bezos we felt like the book would be a fantastic read for the audience. · Ask the investors: Can Bitcoin benefit from the increasing pressure on the US Dollar? In today's show, we assemble the TIP mastermind group for another discussion. The team talks about various stock picks that might out perform the S&P 500. Preston and Stig talk about the airline industry, while Tobias and Hari talk about pharmaceuticals and railroads. · What Bitcoin Cash is and if should you own it? In today's show we talk to Tobias Carlisle about his new book, The Acquirer's Multiple. The book explains how investors can capture better stock market returns by filtering for companies with a low enterprise value compared to EBIT. · What is a good return on the stock market today? · Why is Enterprise value more useful than Market cap when you value stocks? · Can you be diversified owning just one asset class? · How do I size my positions when I buy options? Billionaire Ray Dalio is one of the biggest names in finance. He achieved this recognition due to Bridgewater Associates stellar performance over numerous decades of operations. For instance, during the 2008 financial crisis, the US Stock market was down -50% and Dalio's Pure Alpha fund was up 9.4%. His company has become the largest hedge fund in the world and it trades in almost every market around the world. In this week's episode, we read Ray's new book, Principles. The book was recently released on Amazon in October, and it's quickly rose to numerous bestseller rankings. In this episode, Preston and Stig conduct an analysis of three publicly traded stocks. Since the stock market is currently at one of the highest market premiums ever recorded (the only time it was higher was in 2000), the search for yield produced some interesting results. The companies discussed are McKesson Corp (MCK), Gazprom (OGZPY), and McDonald's (MCD). Should you invest in Russia given the high US stock market? Ask The Investors: What will happen to ETFs if the market crashes? In today's show, we interview serial entrepreneur and part owner of the Atlanta Hawks, Jesse Itzler. Jesse recently held an event in Stratton Vermont where people climbed the mountain 17 times to simulate the climb of Mount Everest's 29,029 feet. In the second part of the interview, Preston talks to 2X World Record Holder, Colin O'Brady about climbing the real Mount Everest. This week's show is all about mindset and what it takes to accomplish very difficult things in life. In this episode, we have an in-depth discussion about Warren Buffett and the Federal Reserve with world renown author, Roger Lowenstein. During the interview, Roger provides interesting first-hand accounts of Charlie Munger and much more. Roger has published six books, and three have become New York Times Bestsellers. Get ready to hear a fascinating interview with one of the best business authors of our generation. The one thing that people don’t know about Warren Buffett? In this episode, we have an in-depth discussion about Bitcoin and upcoming changes to the protocol. Before we have this mastermind discussion with Charlie Lee and Tuur Demeester, Preston provides a monologue on the importance of understanding cryptocurrencies. Our two guests are some of the biggest names in the space. Charlie Lee is the founder of LiteCoin which is a digital cryptocurrency with a market capitalization of $3 billion dollars. Tuur Demeester is one of the first crypto writers and invested in Bitcoin when it was only $2 a coin. In today's episode we talk about one of the most influential sports stars of all time: Michael Jordan. Jordan not only changed the game on the court, but he also changed the game for sports apparel. · Why it was Michal Jordan’s mindset as much as his athleticism that made him the greatest player of all time. · Ask the Investors: How can I continue to educate myself within investing? In this week’s episode, we talk to the New York Times Best-Selling author Martin Ford. Martin is a futurist that writes about Artificial Intelligence (AI) and robotics. This episode specifically covers the topics found in Martin's book, Rise of the Robots. This book was named Business Book of the year by McKinsey and also Financial Times. Ask the investors: How do I diversify my ETF portfolio? In this week’s episode, Grant Williams joins Preston and Stig for an interesting discussion about the FED's decision to start conducting quantitative tightening (QT). Since QT is the opposite of Quantitative Easing (QE), we should expect the opposite market results. Check out this week's episode to see what Grant think about the FED's new announcement and how it will impact markets around the world. · What is quantitative easing and how does it work? · Ask the Investors: How do I value stocks when the interest rate is so low? · Ask the investors: How do I value stocks with declining net income? This is a continuation of last week's mastermind discussion where the group identifies two more stock picks that might out perform the stock market. During this mastermind discussion, we try to determine the intrinsic value of two different companies: TenCent Holdings and Fiat Chrysler. Since public markets have existed, there have been occurrences where new and existing owners fight for control of the business. In many cases, these boardroom disputes are resolved with marginal friction. But, sometimes these corporate raiders and take-overs result in dramatic stories and intense learning experiences. Today, we have an incredible guest on the show and his name is Jeff Gramm. Jeff owns his own hedge fund and is also an adjunct professor a Columbia Business School, where he teaches Benjamin Gramm and Buffett Style value investing. Jeff is the author of the book, Dear Chairman, which is an incredible account of some of this biggest boardroom battles that have happened in America. He profiles, boardroom battles from investors like Benjamin Graham, Buffett, Ross Perot, Carl Icahn and many other. In the middle of the interview we ask Jeff about an interesting story that happened to him where Warren Buffett mailed him a signed copy of his own book and let him know how much he enjoyed reading. In 2014, Bill Gates recommended a book titled, "How Asia Works," by Joe Studwell. The book was a thoughtful account on why some Asian countries have succeeded while others have failed to grow. Studwell makes the reasons for such prosperity easy to understand, but difficult to implement. In this episode we talk to Joe about the finer aspects of his book. · How much of Asian economic progress is due to Western influence and why? · If South America and Africa can achieve economic growth like Japan, South Korea, and Taiwan? One of the most fun and energetic entrepreneurs we interview is Jesse Itzler. Jesse is the owner of the Atlanta Hawks NBA basketball team and owner of the 100 Mile Group. Jesse is the founder of Marquis Jet, which was later sold to Berkshire Hathaway's NetJets. In this episode we talk to Jesse about being an entrepreneur and ultra successful business leader. In this week's show, Preston and Stig reflect back on the last 50 episodes and highlight what they have learned. The show covers a wide range of topics from Artificial Intelligence (AI), options trading, value investing, and Benjamin Graham's Intelligent Investor. One of the less known billionaires for people outside of the value investing community is Seth Klarman. Klarman has a very famous book titled, Margin of Safety, which often sells for more than $700 per copy. Today, Preston and Stig discuss what they learned from reading Klarman's book. Charlie Munger’s net worth is about 1.5 billion and as most people know, he’s Warren Buffett’s vice chairman at Berkshire Hathaway. As we’ve talked about on previous episodes, Munger is really a brilliant individual that’s considered a polymath. Few people know that Charlie is an investor with the Daily Journal Corporation in Los Angeles California. As a result, he does a question and answer period every year at the shareholder meeting. One of our good friends Hari Ramachandra was lucky enough to attend the Daily Journal meeting this year, and while he was there, he captured some of the best responses that Charlie gave. · Why it would be delusional to think you understand the future of payment systems. In this episode, Preston and Stig read a book that was recommended to them by legendary investor Edward Thorp. The book is titled, "Superforecasting" by Philip Tetlock and Dan Gardner. Since the last time The Investors Podcast covered crypto currencies in 2015, the price of Bitcoin has increased by over 1000%. Within the last five years, numerous billionaires have suggested that digital currencies are going to be the next big thing. For example, Bill Gates, Google’s Eric Schmidt, Peter Thiel, Richard Branson, and Patrick Byrne. This week, Preston and Stig read Billionaire Howard Schultz' book titled, "Onward." Schultz was the CEO and founder of Starbucks. In the early 2000's, Schultz initially left the company only to return as the CEO in 2008. This book covers his first hand account of the return and why it happened. During the 2Q, 2017 we assembled our mastermind group to have a discussion about the best stocks that could outperform the S&P 500. This week we are very excited to talk to the New York Times bestselling author, Brad Stone. In Brad's new book, Upstarts, he talks about how companies like Uber, Airbnb, and other killer companies of Silicon Valley are changing the way the world works. This episode is the second part coverage of the Berkshire Hathaway shareholder's meeting. In this episode, Preston and Stig talk about their amazing experience from meeting up with the TIP community in Omaha for the Berkshire Hathaway annual shareholder meeting. In this episode, you’ll also hear Warren Buffett’s answer to the best questions asked by the shareholders for the 2017 meeting, and Preston and Stig’s discussion of the responses. Pictures from the event are listed below. In this episode, we talk to legendary investor Jim Rogers. Rogers was the co-founder of the Quantum Fund with George Soros in the 1970s. During his ownership of the Quantum Fund, Rogers captured a 4200% return while the S&P 500 only yielded 47%. Jim Rickards is the New York Times Best Selling author of multiple books on finance and macroeconomics. In this episode, Jim shares his thoughts on various topics concerning investing around the world. In this episode, Preston and Stig talk to the world renown economist and central banking expert, James Rickards. Jim is the New York Times Best Selling Author of books like Currency Wars, The Death of Money, and A New Case for Gold. During this episode, Jim describes the checklist he uses to identify whether the FED will raise or not raise the federal funds' interest rates. In this episode, Preston and Stig read Columbia professor, Joel Greenblatt's book, You Can Be A Stock Market Genius. Greenblatt isn't your tyipcal professor with a net worth of 600 million dollars and an average annual hedgefund return of 50% during the decade his fund was operational. In this show, we talk to the brilliant Christopher Whalen about his new book titled, Ford Men. Whalen provides profound research into the ultimate success of the Ford Motor Company. One of the biggest names in self-help is Tony Robbins. Since the 2008 financial crisis, Robbins has been on a mission to educate the world about the stock market and the best ways to protect yourself against substantial loss. In 2014, Robbins' wrote the book, Money Master the Game. Today, he has a new book titled, Unshakeable, and it's the #1 investing book on Amazon. In this episode, Preston and Stig discuss what they learned from reading Robbins' newest book, Unshakeable. Recently, we heard an interview where Billionaire Ray Dalio mentioned he purchased a copy of Charles Duhigg's book for everyone in his company to read. As a result, we were captivated by the comment and decided to see what the buzz was about. In this episode, we read Duhigg's newest book, Smarter, Faster, Better, and learn all about productivity. In this episode, you'll learn: Why control is the key to motivating people How to form the best teams? Why GE is setting both SMART goals and strength goals How to statistically make the best decisions Ask the Investors: How diversified should I be when my portfolio is my net worth? In this episode, you'll learn: • Why and how you should evolve from a fixed mindset to a growth mindset • How ego stops your personal development and humility makes it grow • Ask the investors: What would happen in the financial markets if everyone followed a value investing approach? • Ask the investors: How does Stanley Druckenmiller use momentum investing to beat the market? In this episode, Preston and Stig talk to renown author, mathematician, and investor, Dr. Edward Thorp. Thorp's personal net worth is $800M, and he has achieved a 20% annual return for 30 years in the stock market. Before becoming one of the best hedge fund managers on the planet, Dr. Thorp literally wrote the book on card-counting for blackjack. The name of the book was, Beat the Dealer, and the techniques taught in the book went on the create an entire culture around card counting in Casinos. You won't want to miss this conversation as the hosts uncover some fascinating ideas from one of the smartest mathematical minds on the planet. In this episode, you’ll learn: What it's like to get shot into space What it's like to live in the International Space Station What it's like to re-enter the earth's atmosphere Why billionaire Elon Musk thought it was easier to start up a space company than making the cut to become an astronaut at NASA How it literally feels to walk around in space and why it’s very different from what you see in the movies. Why big goals are empowering and how to model your behavior to achieve them. Which impact billionaires Elon Musk and Jeff Bezos have had on the space industry and if we’ll ever colonize Mars. In this episode, you'll learn: Why the story of AOL is really a story about the Internet. How to negotiate with Microsoft when Bill Gates really wants to crush you. Why and how the Internet will be enabled in all devices in the future. Why the biggest merger in the field of technology failed and what we can learn from it. In this episode, you'll learn: • How to build a professional network, so you don’t have to apply for a job the traditional way. • How you develop a competitive advantage as an employee in today’s market • How to take intelligent risks in your business and on your job. • Ask the investors: What are the biggest biases new investors have? In this episode, you'll learn: If new investors should build their portfolio around small cap stocks. Why there is more to it than just picking companies you understand How to identify a stock pick that has pricing power. A rather untraditional approach to identifying good stocks. Ask The Investors: Should a value investor invest in net-net stocks? In this episode you will learn: Why value investors have the perfect temperament to follow a momentum strategy. If investors can improve their momentum strategy by individual stock picking. Why Dr. Gray is long US stocks though he believes they are highly overvalued. Ask the Investors: Why and when you should consider shorting the S&P500. Ask the Investors: What moment did you decided to become a lifelong learner? In this episode, you'll learn: Why momentum investing is not the same as growth investing Why value investor should consider a momentum strategy in their portfolio Why investing is like poker, where the best players win over time Ask the investors: What do you look for in a 10K? In this episode, you'll learn: Why Mohnish Pabrai recently invested in Southwest Airlines. What Mohnish Pabrai’s biggest investment mistake is, and how he later made more than $100 million because of it. If Warren Buffett and Charlie Munger consider any macro decisions in their investment approach. Why the airline industry is a terrible sector, but might still be a great investment at the moment. In this episode, you'll learn: How to use Six sigma to optimize your processes. How to use Validated Learning to develop what the customer truly wants. What Innovation Accounting is and why every start-up should use it. How to develop a minimum viable product, and push it out as soon as possible. Why you should always ask “Why” 5 times when your company faces a problem. In this episode, the mastermind members discuss the following topics: Why Berkshire Hathaway is building a small equity position in the airline industry. Why gold might be a good asset class depending on the country you live in. What has caused the sell-off in bonds and how that will influence the stock market. Why India recently took the biggest currency bills out of circulation overnight. In this episode, we interview one of the best investors of all time, Bill Miller. We discuss the following topics: Why Bill thinks some value investors miscalculate the value of Amazon. Why billionaire macro investors think that bond yields might go to 6% in 12-18 months. If the Enterprise Multiple is the best key ratio to filter stocks by. Why Bill thinks Apple was a bad capital allocator and how they have improved. How Bill views the value of Tesla at the end of 2016. In this episode, you'll learn: Why we faced a crisis in 1998 and 2008, and why me might have an even bigger crisis in 2018. That the FED is leveraged 113-1, and why the IMF will be bailing out the FED during the next crisis. What “SDR money ” is and why it will become the new global currency anyone noticing it. Why the conventional economic models are wrong, and which type of science should be used to replace it. In this episode, you'll learn: How Bill Gates and Paul Allen founded Microsoft and why it couldn’t have happened without their complimentary skill sets. Why Bill Gates and Paul Allen had all the right external factors on their side to become billionaires. What you might do when you retire at age 30 and have more than a billion dollars. If Microsoft has the right business strategy for the future. In this episode, you'll learn: Why the best company leaders consider themselves lucky rather than skilled, and why you should do the same. How to find the right people for your organization by asking “why” multiple times. Why and when it pays to be a pessimist in life and in business. Why the great companies would rather use technology as an accelerator, but never as a creator for their concepts. Why success always looks to be happening overnight, but in reality is always a question of consistency. In this episode, you'll learn: Why margin debt might be a good indicator for future stock returns Why cash and real assets like gold are the least risk right now How Preston’s junk bond position has performed Which monetary policy Janet Yellen should execute Why Minsky’s theory is important for volatility trading Ask the Investors: How do I value goodwill? In this episode, Preston and Stig interview the legendary Dr. Robert Cialdini. Dr. Cialdini is a New York Times Best Selling Author and is one of the leading researchers in the world for psychology and influence. In the interview, Dr. Cialdini talks about some of the new ideas found in his new book titled, Pre-Suasion. In this episode, Preston and Stig talk to private equity expert, Doug McCormick, about using business principals to invest your family income. Doug provides some unique ways to think about spending one's time and treating it like an asset. Billionaire Warren Buffett said his investing approach is 85% Graham and 15% Fisher. Because of this quote, Preston and Stig read Philip Fisher's famous book, Common Stocks and Uncommon Profits. The book provides an interesting background on qualitative investing. Fisher's style is geared towards teaching the reader how to look for growth companies that promise expansion in their respective markets. In this episode, Preston and Stig read the book, Creativity Inc., by Ed Catmull. This was a fantastic book for anyone wanting to learn how to be more creative. Additionally, the book goes into great detail describing the important aspects of designing a business that will have an enduring competitive advantage. In Preston and Stig's 100th episode of The Investor's Podcast, they celebrate by cold calling a few members of their audience. The members of the community can ask any question they want in an unscripted and open format. Additionally, Preston and Stig talk about what their key take-aways were after studying billionaires and the market for 100 shows. In this episode, Preston and Stig learn about the Chinese billionaire Jack Ma. Jack is the founder of the internet company, Alibaba, which is the biggest internet company in Asia. His company has over 407 million users and quickly growing. Within the next five years, Alibaba may ship more packages per day than all the daily mail in the United States. Preston and Stig learn about Jack by reading Duncan Clark's new book, Alibaba. View the Show Notes for this episode Read reviews of, The Power of Habit, on Amazon In this episode, Preston and Stig talk about the New York Times best selling book, The Power of Habit, by Charles Duhigg. The book is an amazing opportunity to learn about your personal habits and how powerful they are at controlling your daily life. Once an individual recognizes which habits they want to reform, Charlies provides methods for re-programming your life. In this episode, Preston and Stig talk about Billionaire Phil Knight and how he founded Nike. They use the book, Shoe Dog, to gather a first-hand account of Phil's journey at starting the business. You will learn about the struggles and difficulties of starting a brand and a new business. In this episode, Preston and Stig talk about the most recent book they read, Delivering Happiness. This book was written by billionaire Tony Hsieh and it was one of the best books that Preston and Stig read in 2016. In this episode, Preston and Stig talk to one of the most notable macro investors in the world, Raoul Pal. Raoul is the owner and CEO of Real Vision TV and he has interviewed some of the biggest names in finance. During this interview, Raoul talks about some of the biggest ideas he has heard from billionaire hedge fund managers and high net worth individuals. In this episode, Preston and Stig have a mastermind discussion about BREXIT with two close friends that live in the UK and Germany. The discussion centers around the potential of other countries leaving the EU and central banking. The group discusses the potential risks of more exits from the EU along with thoughts of other famous billionaires on the issue. In this episode, Preston and Stig interview the billionaire owner of the Atlanta Hawks, Jesse Itzler. Jesse discusses his experience of living with one of the most extreme athletes in the entire world for 30 days. Additionally, Jesse talks about being successful in business and his sale of Marquis Jet to Warren Buffett. In this episode, Preston and Stig talk to billion dollar hedge fund manager, Jesse Felder. Jesse talks about the investing approach of a couple billionaires and he identifies some of the biggest risks to the current global economy. In this episode, Preston and Stig interview oil expert, Gail Tverberg about the current market conditions with oil and other commodities. If you're wanting to understand why the oil market might be heading lower, Gail provides some interesting arguments why low interest rates and government manipulation is causing major issues. In this episode, Preston and Stig talk about Warren Buffett's favorite book, The Intelligent Investor. In this episode, Preston and Stig play the 5 best questions that were discussed during the Berkshire Hathaway Shareholder's Meeting. In this episode, Preston and Stig read a book by Ted Turner titled "Call Me Ted". The book discusses the life and business adventures of the author. It provide a glimpse into the decisions and thought process of growing a billion dollar empire. In this episode, Preston and Stig discuss T Boone Pickens' book, "The First Billion is the hardest". Pickens is a oil Tycoon from Texas and his book outlines his life of business decisions and capital management. At the end of the show, The Investors answer three questions from the members of their audience. In this episode of The Investor's Podcast, Preston & Stig have their second part interview with renown economist, Jim Rickards. In this episode, Jim talks about his book, The New Case for Gold. Jim shares his conversation with Ben Bernanke, what types of environments gold performs well, and when people need to be on the look-out for a down-turn in the economy. In this episode, Preston and Stig interview world renown economist Jim Rickards about his new book, The New Case for Gold. In the interview, Jim talks about people that have influenced his way of thinking, how global currencies work, the Chinese Yuan, the Japanese economy and many other topics. Although everyone knows trust is important to the success of any organization, Stephen Covey takes the idea to a much deeper level. In Covey's book, The Speed of Trust, you'll learn how trust is an economic issue that revolves around the speed at which people and organizations operate. One of the key leadership books that billionaire Jeff Bezos recommends for all his employees is Peter Drucker's, The Effective Executive. In this episode Preston and Stig talk about the leadership lessons they learned from reading this book. In this episode, the investors talk to author of the "Modern Monetary System" - investing expect Cullen Roche. Cullen talks about some of the different investments that billionaires are making in the current market conditions. Additionally, he has a discussion about negative interest rates and how the banking system fundamentally works. In this episode of The Investor's Podcast, Preston and Stig read a book from Billionaire Oprah Winfrey. Although this episode isn't the typical accounting and financial talk, the information discussed might be some of the most important information a person needs to be successful in life. In this episode, The Investor's Podcast mastermind group discusses a wide array of topics from oil, currencies, Japan, Warren Buffett's Shareholder Letters, and much more. In this episode, Preston and Stig discuss the topics covered at the Davos World Economic Forum. Additionally, the investors discuss the book, The One Thing by Gary Keller. In this episode, Preston and Stig review George Soro's book, The Alchemy of Finance. Additionally, The Investors discuss three questions from the audience at the end of the show. In this episode, Preston and Stig review billionaire Howard Marks' book, The Most Important Thing. In this episode, Preston and Stig interview multimillionaire Nathan Latka about creating your own assets. Nathan created a $10 million dollar company by the age of 24. In this episode, Preston and Stig take value investing questions from the audience. You won't want to miss their discussion on intrinsic value and many other numerous topics. Additionally, the investors review Walter Isaacson's book, Benjamin Franklin. In this episode, Preston and Stig interview global value investor, Meb Faber. Meb discussess the methods for investing internationally and also on how to conduct a clone investing approach to other famous investor's stock picks. In this episode, Preston and Stig talk about one of Warren Buffett's Favorite Books, How to Win Friends and Influence People by Dale Carnegie. In this episode, Preston and Stig talk about billionaire George Soros' prediction that the current market conditions resemble that of 2008. Additionally, the Investors talk about Michael Lewis' book Boomerang. In this episode, Preston and Stig discuss the New York Times best selling book, Liar's Poker by Michael Lewis. In this episode, the mastermind group discusses new and trending topics. Those topics include: investing in technology during the 4Q 2015, momentum investing combined with value investing, taking short positions in junk bonds, the Japanese currencies. In this episode, Preston and Stig discuss the key points from the book, Irrational Exuberance by Robert Shiller. In this episode, Preston and Stig discuss the key aspects of the book, Buffett: The Making of an American Capitalist by Roger Lowenstein. In this episode, The Investors talk to quant investing expert Patrick O'Shaughnessy. Patrick talks about his experiences in statistical backtesting and modeling of the stock market. In this episode, Preston and Stig discuss their notes on Warren Buffett's Favorite Book, Security Analysis. This book was written in the 1930's and it's an enormous text. Many people in finance refer to the book as the bible of Value Investing. In this episode, the Investors talk to Tren Griffin about his new book on Charlie Munger. Munger is Warren Buffett's Vice Chairman at Berkshire Hathaway and one of the most influencial people in shaping Buffett's investment approach. In this episode, The Investors talk to money manager Cullen Roche about the modern monetary system. Cullen was one of the few financial thinkers that predicted the deflationary forces that would occur from the FED's quantitative easing, so we talk to him about his model and how he arrived at his conclusion. In this episode, Preston and Stig talk about the best selling book, The 7 Habits of Highly Effective People by Stephen Covey. In this episode, Preston and Stig interview Kabir Sehgal about his New York Times best selling book, Coined. The book provides a rich story of money and how its history has shaped us. In this episode, the Investors talk to legendary investor, James O'Shaughnessy about his book, What Works on Wall Street. In this episode, The Investors discuss the ever changing commodities market and potential impact that China might have on Japan's economy. In this episode, media expert, Dori Clark, talks about how people can create online assets and develop a following around their content. In this episode of The Investor's Podcast, the mastermind group discusses new information about Mohnish Pabrai's Dhandho Holding Company, the Japanese Stock Market, Currency Concerns, Quantitative Easing, Warren Buffett's recent stock market purchases, and much more. In this episode of The Investor's Podcast, Preston and Stig start the show by talking about the current market conditions. They focus their discussion on the quantitative easing that's happening in Europe and Japan. After the initial discussion about the stock market, the Investor's discuss the newest book they read, Thinking Fast and Slow. In this episode, Preston and Stig discuss Ashlee Vance's book about Elon Musk. If you want to learn more about one of Sillicon Valley's most unique investor/inventor, you won't want to miss this episode. In this episode, we talk about billioniare Mark Cuban's book and how he acquired his wealth. In this episode of The Investor's Podcast, Preston and Stig talk about the crazy volatility in the financial market at the end of August 2015. Additionally, The Investors read billionaire Chris Sacca's favorite book, The Magic of Thinking Big. In this episode, we continue our discussion with Dr. Wesley Gray. This time around, Dr. Gray talks about Quantitative Value Investing and how individuals can take advantage of mean reversion. This episode is an advanced look at how Exchange Traded Funds, or ETFs, work. We talk with fund manager, Dr. Wesley Gray, about some of the unknown secrets in the finance industry. In addition to the ETF discussion, Stig and Preston talk to Wes about the current market conditions. Billionaire Jeff Bezos and many other tech mogals have heavily endorsed the book, The Black Swan. As a result, we read the book and recorded our discussion of the key points. In this episode of The Investor's Podcast, we talk about billionaire Jeff Bezos, Mark Cuban, and Michael Bloomberg's favorite book, The Innovator's Dilemma. In this episode of The Investor's Podcast, we interview leadership expert, Mike Figliuolo. Mike talks about the ways that leaders can optimize the performance of their subordinates. Additionally, he discusses the key variables of what to look for when investing in a business. In this episode of The Investor's Podcast, we talk to the Best Selling author, Morgan Downey, of the book Oil 101. You won't want to miss his episode if you have an interest in the recent downturn in the oil market. This In-B-Tween episode covers Warren Buffett's intrinsic value and current conditions in the bond market. In this episode of The Investor's Podcast, the panel discusses the impact of oil, current market conditions, and top performing Billionaires and their investing approach. This In-B-Tween-isode covers the importance of competitive advantages. The specific competitive advantage we discuss is the power of a brand. In this episode of The Investor's Podcast, we discuss the key highlights of Warren Buffett's Berkshire Hathaway shareholder letters. Preston and Stig discuss look-through earnings, intrinsic value, and the overall business structure. In this episode, we research Warren Buffett and Bill Gates' opinions about heroes. In this episode of The Investor's Podcast, we interview West Point economics instructor, Brian Retherford, about the 7 biggest mistakes new investors make in the stock market. In this episode of The Investor's Podcast, we talk about what we learned from reading Billionaire Richard Branson's book, Screw it, Let's Do it. In this 5 minute episode, Preston lay's out the 3 C's of leadership that he learned at the 101st Airborne Division. In the second part interview with William Green, we discuss the investing approach of Mohnish Pabrai and Joel Greenblatt. The discussion centers around the fundamentals and differences that the great minds of investing share. In this episode of The Investor's Podcast, William Green talks to us about his new book, The Great Minds of Investing. In this Interview we discuss Warren Buffett, Benjamin Graham, Charlie Munger, and many other investment gurus. In this episode of The Investor's Podcast, we discuss the book Hedge Fund Wizards by Jack Schwagger. In the episode, we focus on the ideas of Ray Dalio, Edward Thorp, and Joel Greenblatt in order to discuss the approaches we liked the best. In this episode of The Investor's Podcast, we have an engaging discussion with Jos Schmitt about his adventures in starting his own stock exchange. The purpose of his new exchange was to combat the impact of High Frequency Trading on the Canadian Market. If you ever wanted to hear about the inside story of starting your own stock exchange, you won't want to miss this interview. In this episode of The Investor's Podcast, we discuss current events by Warren Buffett, Bill Gates, and Janet Yellen. Additionally, we discuss the ideas contained in economist Jim Rickard's book, Currency Wars. The discussion is helpful for people trying to understand how currencies interact with public debt, gold, and global commodities. In this episode of The Investor's Podcast, Joshua Dorkin talks about his experience in the Real Estate market and how to conduct wise investment choices. Josh runs the very popular Bigger Pockets Real Estate community. The group discusses risks in long term interest rates and fun ideas like house flipping. You won't want to miss this interesting conversation on how real estate investing is done the right way. In this episode of The Investor's Podcast we talk to professional trader and hedge fund manager, Tres Knippa. Tres talks about his unique positions in shorting the Japanese debt and currency markets. Tres believes the Japanese currency is destined for failure based on the government's inability to sell newly issued bonds to anyone other than themselves. The interview is very interesting and it's sure to give you some interesting ideas for the next stock market crash. In this episode of The Investor's Podcast, Preston and Stig discuss the newest book they read titled: The Escape from Balance Sheet Recession and Quantitative Easing Trap. The book was written by the economist Richard Koo and he talks about the comparison between Japan in the 1990's and the World Ecomony today. In this interview, author Gillian Zoe Segal, talks about her interviews with Warren Buffett and many other Billionaires. In Gillian's new book, Getting There, she interviews 30 people that have become enormous sucesses. Stig and Preston ask Gillian how she got the interviews and the best pieces of advice she was provided by her subjects. In this episode the Investors talk about the disruptive new digital currency technology that's growing around the world. Bitcoin and other cryptocurrencies could eventual become a popular form of payment without limits across international boarders. This is a fascinating discussion that you won't want to miss. In this episode of The Investor's Podcast, we explore the history and impact of the Federal Reserve. As you will see, the Federal Reserve has the biggest impact on the growth and contraction of any other variable. We discuss that variable, the money multiplier, in this episode. In this week's episode of The Investor's Podcast, we learn about one of the most foundational books ever written on success: Think and Grow Rich, by Napoleon Hill. This book has an interesting premise - the things you think about most will materialize into your life if you have faith and reason. In this episode of The Investor's Podcast, Andrew Sather talks about the dangers of value traps when conducting value investing. This is an important episode for many of the investors that try to impliment Benjamin Graham or Warren Buffett style investing. In this episode of The Investor's Podcast, we discuss the key points from the book, Rework. The billionaire Mark Cuban said that if given a choice between a person with an MBA or a person who read the book, Rework, he would pick Rework every time. At the end of the show, The Investors discuss the comments by billionaire Ray Dalio and famous Harvard professor, Larry Summers. In this episode of The Investors Podcast, we interview the author of the book, Deep Value. This book is a fascinating read that statistically demonstrates the theory that companies with very bad past performance (with respect to earnings), tend to outperform high premium picks. The book was highly influenced by Benjamin Graham and Joel Greenblatt and it comes highly recommended by Preston and Stig. In this episode of The Investor's Podcast, we review Malcolm Gladwell's famous book, Outliers. We discuss the key ingrediants for what it takes to become an outlier and what people should be thinking about if they really want to become an enormous success like Bill Gates or the Beatles. At the beginning of 2015, the Stock Market is at an all time high. As a result, The Investor's ask MorningStar's expert, Paul Arnold, about the proper asset allocation during these periods of high valuations. If you have a lot of money in the stock market, you might want to listen closely to this weeks episode. The Billionaire Charlie Munger has said that the book, Influence by Robert Cialdini is his favorite book of all time. In this episode we talk about the top level ideas found in Cialdini's book and relate some of the concepts back to stock investing. Have you every wanted to buy commercial real estate, but you didn't know how to get into the game? In this episode, we harness the decades of experience from our mystery guest and learn how he built a real estate portfolio with over 100 units. You'll learn how real estate is valued and the general principals to good management. Pat Flynn is an internet superstar that has created a multimillion dollar enterprise around online business. In this episode, Pat shares some of his secrets for creating new assets. Finance can be a very dry subject, but this episode is surely going to debunk that opinion. High Frequency Trading is a fascinating story of how a few elite technologists have outsmarted big Wall Street banks in making Billions of dollars through 1 cent increments. The problem is the common investor is the one paying the bill. You won't want to miss this exciting and ever changing story. In this episode of The Investor's Podcast, Preston and Stig talk about what they learned in Tony Robbins' book, Money: Master the Game. During their discussion, they talk about the myths of investing and they also talk about the advice of a few billionaires. This was a fun and interesting episode that you won't want to miss. Have you ever wondered what it would be like to go on the hit TV show, Shark Tank? In our interview with Stephan Aarstol, we ask him insider questions and also what it's like to be a business owner with billionaire Mark Cuban. The episode generated some good discussion about search engine optimization (SEO) and running an online business. Are you getting ripped-off by owning a mutual fund? We think so, but let's here what MorningStar expert, Alex Bryan has to say. Learn what other options you have for protecting your principal and growing your money. In this second part interview with Guy Spier, The Investor's continue their discussion with the author of, The Education of a Value Investor. This episode discusses intrinsic value, Guy's checklist, and how to protect your capital during adverse conditions. In this episode of The Investor's Podcast, we have the renown Guy Spier on the show to talk about his new book, The Education of a Value Investor. in 2008, Guy and Mohnish Pabrai bid $650,000 to have lunch with Warren Buffett. In our interview, you'll quickly learn there's a lot more to guy than investing and expensive lunches. In this episode of The Investor's Podcast, we have a discussion about Google and the book, In The Plex. If you ever wanted to know more about the Google founders, Larry Page and Serga Brin, or how Google makes money, you'll definitely enjoy this episode. In this episode of The Investor's Podcast, we have a discussion with the author of, The Emotionally Intelligent Investor, about psychology and Stock Investing. If you're interested in learning about your conscious and unconscious decisions, this episode will definitely peek your interest. In this episode of The Investor's Podcast, Stig, Preston, and Hari, discuss Jeff Bezos's success with Amazon. The catalyst for the discussion is Brad Stone's Book, The Everything Store. Click here to download our executive summary of this book. Members who sign-up on our mailing list will recieve these free book outlines/summaries in the future. In this episode of The Investor's Podcast, Stig and Preston have a question and answer period with Peter Gaudet - an owner of his own Investment Bank. The panel discusses venture capital and how to be successful as the founder of a company. In this episode of The Investor's Podcast, Stig and Preston discover Charles Koch's secrets to financial success. They base their opinions on Charles' book, The Science of Success. This episode is packed with valuable information, so you'll definitely want to check-out their show notes. In this episode of The Investor's Podcast, the panel is asked important questions from a new value investor that's interested in putting money into the stock market. If you're looking to do the same, or you're interested in hearing some fantastic questions, you won't want to miss this week's episode. In this episode of The Investor's Podcast, the panel discusses the ideas of Peter Thiel. Peter is a famous Silicon Valley Billionaire who founded PayPal and Palantir. He also owned a 10% stake in Facebook. The Investors, along with Hari Ramachandra, discuss Peter's new book - Zero to One. In this episode of The Investor's Podcast, the panel discusses the impact of interest rates on Stock Market Crashes. The Investors are joined by Rob Mercuri, who's a Vice President of Risk management from a top-ten consumer bank in America. You won't want to miss this episode if you want to know how top executives view the market as a whole and how to take advantage of potential opportunities. In this episode of The Investor's Podcast, we have a fun and casual conversation with Gregg Pisani - a former trader on the floor of the NY Stock Exchange. Gregg discusses the typical work day and what it's like processing millions of trades each day. If you've ever wondered what all those people are doing on the floor of the NY Stock Exchange, you'll probably enjoy listening to some of Gregg's funny experiences. In this episode of The Investor's Podcast, Hari Ramachandra discusses his investment in the Pabrai Funds, managed by the emerging, and newly famous, Mohnish Pabrai. Pabrai has adopted the same principals as Warren Buffett, and Hari discusses the similarities and differences during the episode. Hari also discusses his experience of attending Pabrai's shareholders meeting. Have you ever wondered what rules Warren Buffett might use to analyze potential stock picks. In episode three, the Investors discuss Buffett's 4 rules to selecting a successful stock pick. You won't want to miss this important discussion! In this session of The Investor's Podcast, we discuss the two methods of receiving earnings and Benjamin Graham's Mr. Market example. In this session of The Investor's Podcast, we discuss the fundamental elements of Warren Buffett's investing approach in the stock market.